When courgettes are small and fresh I like them raw, thinly sliced with lemon juice and mint. With slightly larger courgettes, slice and slow cook on the hob in a little oil with garlic and dill for well over an hour. They turn hopelessly soft and rich. Spooned onto toast or turned through pasta with crumbled goats’ cheese or feta, this makes a really comforting lunch. Slice the courgettes into rounds as thick as a £1 coin. Place in a bowl, add olive oil, garlic, salt and pepper. Tumble together, then lay out in a single layer over a large baking tray. Pre-heat the grill to high and cook for about 6–10 mins on each side until golden. Return cooked courgettes to the bowl. Add chopped mint, spring onions, dill and lemon juice. Combine well. Tear the chicken into pieces and turn through the warm courgettes. Finish with a glug of olive oil and season. 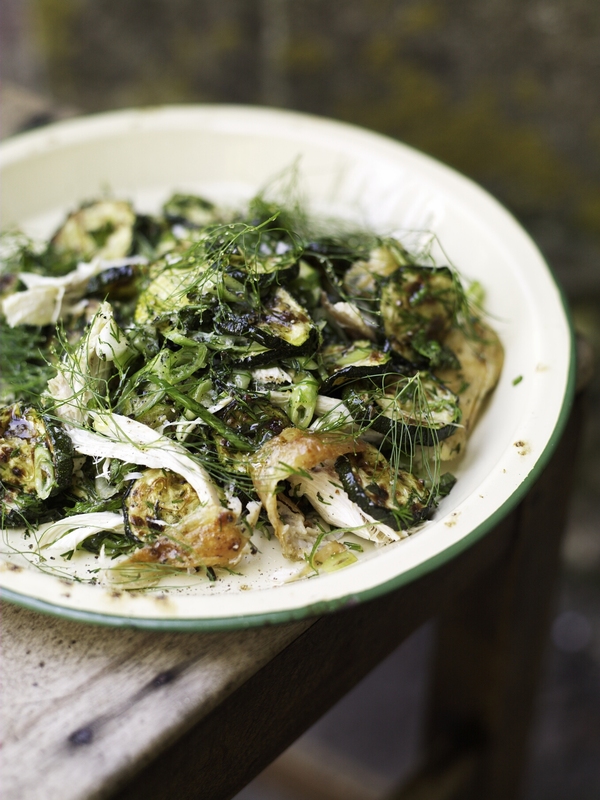 Serve the salad while still warm with some sprigs of dill or fennel tops to garnish.